This is one of our most entertaining and best-selling ride on cars on the market. What makes it so good is that it hits the sweet spot between craftmanship, performance and value. The Mercedes-Benz Style Electric Ride On Car isn’t officially licensed by Mercedes-Benz, but that doesn’t make it an inferior product. At rideontoys4u.co.uk, we provide four rich colours to choose from (white, black, red and pink), so there’s variety for every taste. And, bragging a host of cool kids car features and enhancements, the Mercedes-Benz CLA Style ride on is a humdinger of a toy. The kind of features ride on cars brag is one of the main reason they are so much fun. The more sights, sounds, and tricks, the better. The Mercedes-Benz CLA Style Ride On Car has got a few up its sleeve that’ll impress the entire playground. If you’ve got the kind of kids that enjoy some tunes with their twists and turns, then the MP3 Input function is the bee’s knees. The CLA allows riders to connect portable devices via an aux input to the car. Once connected, the car amplifies the music out the speakers built into the car. Beyond the music, the CLA has a series of built-in sound effects that give it a realistic feel. Sounds include a horn and turning sounds. It also has headlights as the icing on the cake. Maybe your little ones fancy a spin in low light – it’s no problem. The Mercedes-Benz CLA is fitted with powerful lights in both the head and rear. Switch between a high and low gears with just the flick of a switch. This feature is especially helpful when you kick the kids car into reverse gear whilst parking. Just to boost that authentic driving experience, this is a ride on car that has two openable doors on each side. Whilst this doesn’t mean the vehicle can accommodate more than one rider, it does make access a little easier. You won’t see these ride on cars being mixed up with any others. Its distinct design is unmistakably brilliant and the build quality is second to none. 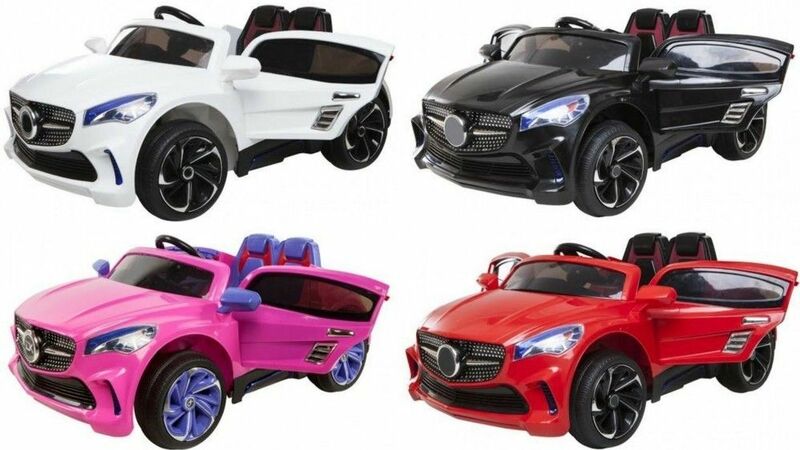 For parents in search of electric cars for kids who want an attractive, enviable look, then search no further. As ride on cars go, this is one that is perfectly manageable – even for toddlers. The Mercedes-Benz CLA Style ride on is compact and light enough to pick up and store away around the house. Measuring in at around 117cm (length), 78cm (width), 55cm (height), and weighing 30kg, parents can ferry the ride on easily to a play area. When the day is done, stow the ride on car away in a convenient spot with no hassle. Still, just because this kids car is a bit of a whippet, doesn’t mean that the interior space is confining. In fact, with its spacious seating area, this is one of few electric cars for kids beyond its recommended age of 2-4 years old. Ride on cars are, obviously, built with the utmost consideration for the safety of the child driver. The Mercedez-Benz Style electric ride on car is no different. Between its sturdy build, modest speed limit, seatbelt and parental remote control, you can rest assured of a safe playtime. Here’s what really matters to little rascals. It’s okay having a great-looking kids car but ride on cars that deliver great performance are another thing. Fortunately, the Mercedes-Benz CLA provides plenty of both. Still, the manoeuvrability and controllability that it offers elevates this electric ride on beyond other ride ons. At a push, on a full charge, the Mercedes-Benz CLA Style car can reach up to 5mph. That may sound slow but, for a toddler still learning about their bodily movements, it’s for the best. Most ride on cars are accelerated either by foot pedal beneath the steering wheel or using the parental control. This kids car offers the same simple usability. The steering works well with the pace of the ride on. Whether using the steering wheel or the remote control, these ride on cars don’t allow for sharp turning. This makes them safer and smoother to drive. But, in order to get the best feel whilst driving, we advise that the ride on be driven on flat ground. In order to stop, you simply have to stop using the accelerator. Whilst ride on cars like this Mercedes-Benz CLA Style kids car mimic the experience of driving, they’re not entirely like cars. So, children don’t just roll down the street if you don’t flip up a handbrake. There’s actually a lot of power under the hood of this ride on. This means two things: that the Mercedes-Benz CLA takes a while to charge, and it takes a while to lose charge. A full charge is capable of producing approximately 1 hour of playtime. And it’s a strong, consistent run without lapses that cause the ride on to slow.